Article first published as Mango Sorbet on Blogcritics. With warm weather now here, it's that time of year again! Although I try to use it all year round, I find myself really maximizing my ice cream maker during the warmer months just like most people. Perhaps this year I'll keep it out through the holidays so I can make some fall and winter flavors. 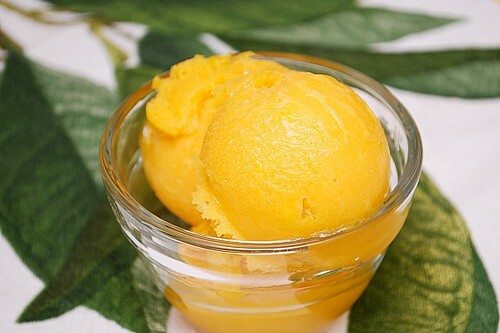 But for the time being, I dusted off my ice cream maker to whip up some cool treats like this Mango Sorbet. It's like eating a cold, creamy fresh mango with a spoon! Making this was fairly easy... if you have the right tools. First off, you'll need a food processor or better yet, an immersion blender to make a fresh mango puree. From there, the puree is combined with sugar, lemon juice and vodka until the sugar is completely dissolved. This mixture must chill before churning so I recommend prepping a day in advance. Once the mango mixture has chilled, you can then churn it in an ice cream maker. From there, transfer to a freezer safe container and allow the sorbet to freeze a few hours before enjoying so flavors can meld. Combine mango puree, sugar, lemon juice, and alcohol in large bowl. Stir on and off for several minutes until sugar has dissolved. (Or, to speed chilling process in next step, combine ingredients in a metal bowl set over a larger bowl filled with ice water.) Rub finger along bottom of bowl to see if sugar has dissolved. Pour chilled mixture into container of an ice cream machine and churn until frozen. 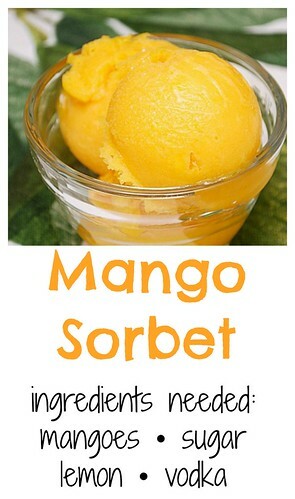 Hmm i love mango and i love the sorbet, in conclusion this is the perfect recipe for me and for sure i will try it. Thanks a lot for sharing with us. Wow! Beautiful sorbet! Mango is my favorite flavor (tied with Blackberry). This will be the first recipe to go into my new ice cream maker! Mmmm...I love this! I cant get enough of ripe mangoes.